Tells people how BJP government in state and centre has benefitted the hill state. 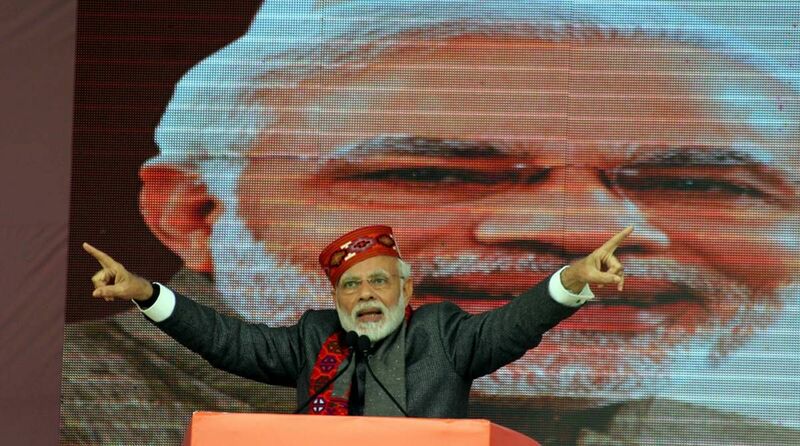 Setting the pitch for Lok Sabha polls 2019, Prime Minister, Narendra Modi on Thursday tried to strike local chord with the people of Himachal and said whenever he visits Himachal, he feels as if he has come home. Modi, who was here to address a ‘Jan Abhaar’ rally to mark one year of Bharatiya Janata Party (BJP) government in Himachal, said he has seen the hill state closely when he was BJP in charge here (in late 90s) and the people here are affectionate, simple and peaceful. “It is a dev bhoomi and veer bhoomi both with so many brave soldiers sacrificing their life to defend the borders of the country,” he said. Modi went on to admire the Kangri dham (local food), listing the dishes right from mash, chana, jimikand to madra, while mentioning that this time he wouldn’t be able to have a taste of the delicious Pahari food, as he has to rush back to Delhi. Happy with a good turnout of people at the rally, Modi praised Jai Ram Thakur’s government for new initiatives taken in first year to reach out the masses. “One year is too less a period. Even then so much has been done in Himachal. I really like the slogan ‘Imandaar Prayas ka, ek saal vikas ka’ he said. He said with his vision for long term development of the state while generating employment opportunities, Jai Ram Thakur has proved the old saying that ‘Pahad ka paani aur pahad ki jawani, kabhi pahad key kaam ni aatey’. “But now the Himachal government, with its vision for development, will take care that the water does not go waste, and the youth also does not go out for jobs,” he said. He said the steps taken for agriculture, industrial development and tourism in Himachal were appreciable. Modi talked of his love for the Himachal cap, that he said, is always in his bag. “When I went to Israel, at one place, we had to cover our head. So I took out Himachali cap for that. The gesture was so much publicized and I got so many letters from the Himachalis on that. In a way, such things also help promote tourism in the state,” he shared. Exhorting the people that the ‘double engine’ (BJP in state and Himachal) would be the best for Himachal Pradesh, he elaborated that how his government has been giving massive financial support to the hill state. “Himachal got financial aid of Rs 21000 crore in previous UPA government. In our tenure, the state has been given 72000 crore. The Centre trusts Himachal as the government will spend the money judiciously,” he SAID. He talked about the central schemes helping value addition and marketing of crops in Himachal, the centre’s move to tell the companies making aerated drinks use some fruit juice in it ( to help the fruit growers) and the ambitious Ayushman Bharat scheme for health benefits to poor people. Modi said Himachal was progressing in agriculture and it may soon become organic state with the farmers shunning the use of chemical fertilizers.